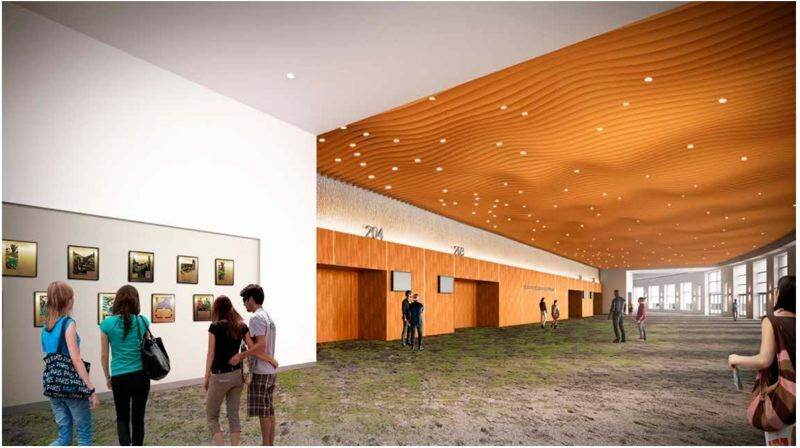 The nearly 30-year-old Oregon Convention Center is undergoing a $39 million renovation. The project, which includes interior and exterior work, aims to update the look of the facility while also increasing the flexibility of its spaces and making it easier for visitors to find their way around the building. The 12-month-long project is slated for completion in September, less than six months before the nearby hotel is expected to open its doors to guests. 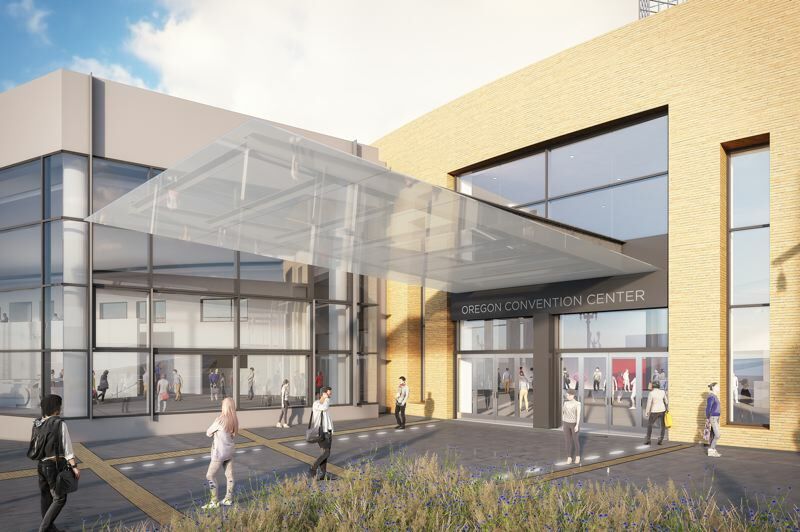 Providing a more polished feel for the convention center to match the sleek digs of its new neighbor is just one reason why this has been the right time for the renovation, according to Craig Stroud, executive director of the facility. The convention center building was completed in 1990, with an expansion tackled in 2003. Since its original opening, however, the facility's overall look hasn't changed. While the wall treatments, lighting fixtures and main signage may have been modern when they first debuted, they've since become outdated, Stroud said. Meanwhile, convention centers across the country are slowly shifting away from generic spaces to those that provide visitors with a sense of place. For the Oregon Convention Center, that means creating a look that pays tribute to the features that Portland and Oregon are known for, from the city's steel bridges to the area's forests. "We've adopted a look that really takes inspiration from nature," Stroud said. "A lot of the texture, the visuals harken to forests or tree canopies." Interior work during the renovation, which is being overseen by Colas Construction as general contractor, has been broken into three phases. The first phase, which started in September and recently wrapped up, focused on pre-function areas of the A and B concourses at the north end of the building. Old carpet with a blue design on a red background was replaced with a new version laid down in tiles rather than by the roll. The tile approach allowed the design team of Seattle-based LMN Architects and Portland-based Merryman Barnes Architects to create color patterns that mimic the experience of walking through a forest. A background of gray tones near an exhibit room, for example, boasts a splash of yellow designed to emulate a bloom of algae or growth of lichens found in a wooded setting. More bursts of yellow as well as patches of red, orange, green and blue will be found in other locations throughout the facility. New fabric wall paper featuring a beige design that calls to mind tree trunks and limbs further enhances the feel of walking through a forest area. Playing into that same theme are stair seats made from wood installed alongside traditional steps. The second phase of the renovation, which calls for carpeting to be laid and walls painted in the pre-function area of Concourse, began recently and is expected to finish in April. The work has required the closure of the entrance on Martin Luther King Jr. Boulevard so work also can be done on the lobby in that area. The third phase of the renovation is expected to begin in May and result in a complete makeover for the facility's 25,000-square-foot main ballroom and its associated pre-function space. A highlight of the remodeled space will be a ceiling treatment. "It's layered individual pads of wood," Stroud said. "There's like a thousand of them that will be hung across the entire room ... when you look up and through, it looks like a tree canopy." 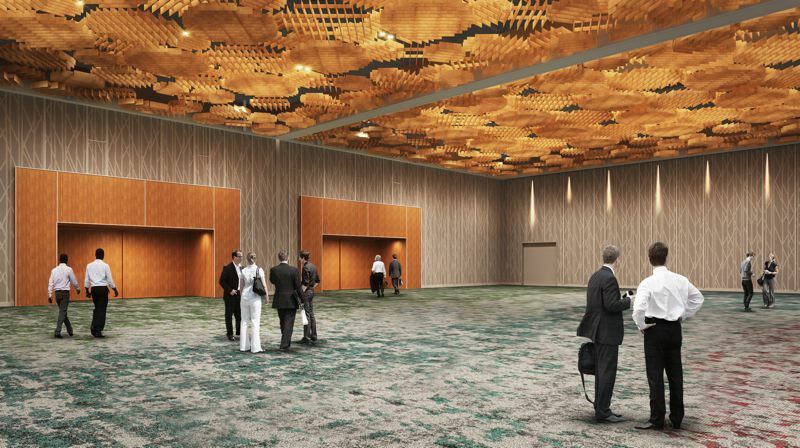 The gathering area outside the main ballroom also will boast a unique feature — a series of perpendicular slats of wood running across the entire ceiling of the space that will mimic the topography of the Cascade Mountain range. To help keep events and construction schedules organized, the project and convention center teams, including Inici Group as project management consultant, created a color-coded chart to track everything, Stroud said. Balancing construction work with the need to keep a public facility in operation is nothing new for Stroud. Before joining the Oregon Convention Center, he served as the bond program manager for the Oregon Zoo during projects such as Elephant Lands and a new veterinary medicine center. The convention center's project manager for the renovation project also previously worked at the zoo. "Lessons learned at the zoo have been very beneficial," Stroud said. The exterior portion of the renovation has been ongoing since the fall. The ticket booths near the building's entrance on Martin Luther King Jr. Boulevard will go away as part of the work, a nod to a new tendency to handle ticket sales near the entry points for specific events inside the facility. The overhead glass canopy, which reaches out from the doors to the public right of way, will be switched out for a single expanse of glass to create what Stroud calls a "more freestanding" look. Closer to the street, the center's "monument" sign, where a roster of events currently being held are displayed, will also be changed out for a sleeker, more modern version. The largest portion of the exterior work, though, is focused on the plaza at the north end of the building. The work will fix some maintenance issues in the area, including places where roots from trees had started to crack pavement. A larger goal, though, is to turn what was rarely used space into a more flexible area that the convention center will be able to use for expanded purposes. When completed, the area will feature an amphitheater-liked design that will allow it to handle concerts and similar outdoor events. There will be room for events associated with the main Oregon Ballroom to be held outside while also keeping them separate from areas with more public access. The design also will help direct visitors to the main entrances. When the new plaza design by landscape architect Mayer Reed is completed, The Dream, a statue of Dr. Martin Luther King Jr. by Michael Florin Dente, will return to the area. A series of trees growing from an old-growth log also will remain. While a large bell and smaller bell from the Bell Circles II piece by Robert Coburn will remain at the north end of the convention center, a second large bell will be relocated to the southeast end of the building. A dedication ceremony at the new location will be held later this year, Stroud said.